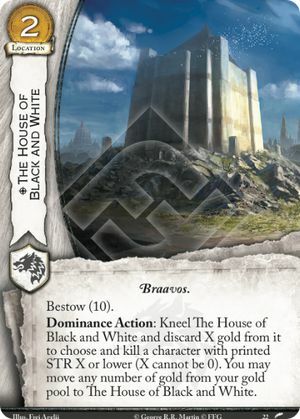 Dominance Action: Kneel The House of Black and White and discard X gold from it to choose and kill a character with printed STR X or lower (X cannot be 0). You may move any number of gold from your gold pool to The House of Black and White. Killing a character and moving gold onto The House of Black and White is all part of the same action. You must legally target a character for a kill in order to move gold onto The House of Black and White. Moving gold does not depend on whether the kill was successful or not. You may kill a character with printed strength 0 (or X) by discarding 1 or more gold.